Annie and Scott Shull founded Raptor Ridge Winery in 1995 on the northeastern side of the Chehalem Mountains, 10 miles north of Newberg. 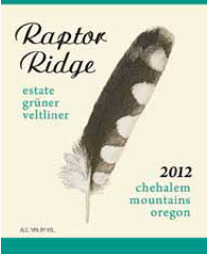 The name of the winery is derived from the many families of raptors that share the winery’s 27-acre estate. The 18-acre estate vineyard is named Tuscowallame, the indigenous words for “place where the owls dwell.” The vineyard is planted in Loess-based Laurelwood soil to Pinot Noir clones 114, 115, 667, 777, Wädenswil and Pommard. 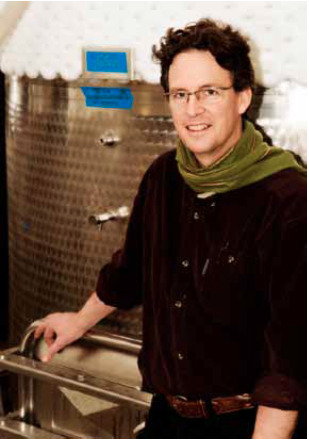 Scott is a self-taught winemaker who specializes in Pinot Noir and Pinot Gris. The winery is also one of the few to produce a Grüner Veltliner. He is very active in the Oregon wine industry, participating as a founding member of the Oregon Wine Board and currently as President of the Chehalem Mountains Winegrowers Assocation. Annie travels extensively throughout the United States to personally represent Raptor Ridge. She is President Emeritus of the Oregon Pinot Camp Board. Besides production from its estate vineyard, Raptor Ridge sources wine grapes from other Willamette Valley growers including Arbre Vert, Bellevue Cross, Carabella, Gran Moraine, Harbinger, Meredith Mitchell, Olenik and Shea. Total production at Raptor Ridge is about 7,500 cases of wine each vintage. The winery’s tasting room is open seasonally and by appointment. The tasting room overlooks the vineyard and adjoining forested mountains and is quite a peaceful site to enjoy. VIP tours and tasting are available. Visit the website at www.raptorridgewinery.com. Raptor Ridge has an “Aroma Apothecary” in the tasting room, something I have never seen at a winery in all my years of travel. The Aroma Apothecary contains a set of 50 basic aromas commonly found in wine. Visitors are encouraged to take an aroma quiz and boost their tasting acumen (list of aromas below). Highly personable sommelier, Tom Champine, manages sales and marketing for the winery and you are likely to see him if you visit. When I visited recently on a glorious sunny morning, I toured the winery with Scott and sampled a few of the winery’s new releases. I did not do a formal sit-down tasting so I can only report some general, yet favorable, impressions. 12.5% alc., pH 3.24, TA 0.59, <1,900 cases, $20. Sourced from several vineyards. Whole cluster pressed, slow fermentation in stainless steel tanks, gently cross-flow filtered and sterile-filtered at bottling. · Bright and clean, with crisp acidity and flavors of apple, melon, pear and citrus. Satisfying. 12.5% alc., pH 3.29, TA 0.56, <101 cases, $20. Whole cluster pressed, fermented with native yeasts, cold-stabilized, cross-flow and sterile filtered at bottling. · Very inspired white wine with crisp citrus flavors and a bright cut of refreshing acidity. Very unique and highly enjoyable. 14.1% alc., pH 3.56, TA 0.50, <500 cases, $45. Includes all clones grown in the vineyard. 100% de-stemmed, 8-day cold soak, proprietary yeast inoculation, aged in 29% new French oak for 9 months. · Aromas of plum, cherry and clove spice echoed on the palate with added complimentary notes of oak. Solid. 14.1% alc., pH 3.54, TA 0.50, <315 cases, $55 (sold out). 100% de-stemmed, inoculated with William Selyem yeast strain, fermented 12 days before pressing off skins, aged 9 months in 50% new French oak. · A special wine in this vintage with enticing aromas of black cherry, cola and sassafras. Mid weight flavors of Bing cherry, raspberry and rose hips tea. Nicely crafted and harmonious with a generous finish. 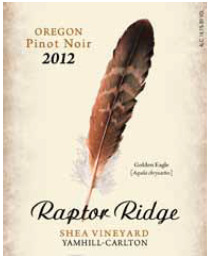 Also reviewed in the PinotFile (www.princeofpinot.com/winery/641/): 2012 Raptor Ridge Willamette Valley Pinot Noir, 2012 Raptor Ridge Gran Moraine Vineyard Yamhill-Carlton Pinot Noir and several Raptor Ridge Pinot Noirs from the 2011 vintage.